This mug has a mirror image on both sides of the mug. The Splinter in the Mind’s Eye logo is positioned opposite the handle at the bottom. 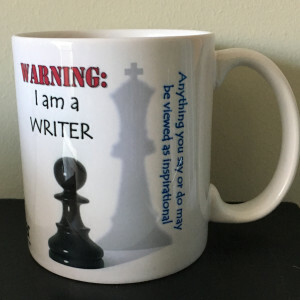 This mug was designed with with writers in mind. At the end of its journey, The Pawn can transform into any chess piece other than The King. As such, it embodies the potential to become whatever serves its king best when the time comes. Be it a third bishop, a third knight or even a replacement queen, the pawn is limited only by the imagination of the one who masterfully maneuvered it to journey’s end. Moving always straight ahead, the shadow it cast has the potential to take on many forms, all of which strike fear into the heart of adversarial leader. It lets all who pass by know that they are being silently observed by the creative mind who may, at any given moment, skillfully extract that one spark of activity as the behind-the-scenes muse which serves to incite the next blazing fire at the the keyboard. WARNING: I am a writer… Anything you say or do may be viewed as inspirational. *Free shipping applied to United States addresses only. We are currently unable to ship outside of the United States.